I have been writing a lot about Yesterday’s Demons, book 1 of The Verdant Revival, which goes on sale in ebook on April 12. You can pre-order it now. If you follow this blog you probably already know all that, you’ve seen the cover, you’ve read the first chapter… but today I’d like to tell you about it from perspectives other than plot. Yesterday’s Demons is a young adult novel, but its main characters aren’t teens, they’re 20-24. That makes it more “new adult” than young adult, but I still call it young adult because it’s definitely the kind of book I would’ve wanted to read when I was a young adult. And content/rating-wise, it lines up with that group as well. Yesterday’s Demons is an epic fantasy. But it has Western elements, too — horses and six-shooters and such. It also has a healthy dose of science fiction. One of the characters carries not a revolver but a laser gun, for example. Yesterday’s Demons is a story about fear. Fear has so much control over us in ways both healthy and not. We save money out of fear for a “rainy day” when we have none. We wear seat belts when we’re in a car for fear of reckless drivers. We set two alarm clocks for fear of not waking up for work on time. But we also push people out of our lives out of fear they might hurt us. Politicians make careers by exploiting our fears of people who are different than we are. We do stupid things to prove we’re not afraid when deep down, we’re really afraid. Fear can cripple us and render us unable to leave the house, or it can drive us to change everything and make the world a better place. High-tech weapons like laser guns exist side-by-side with low-tech weapons like swords and bows and arrows. 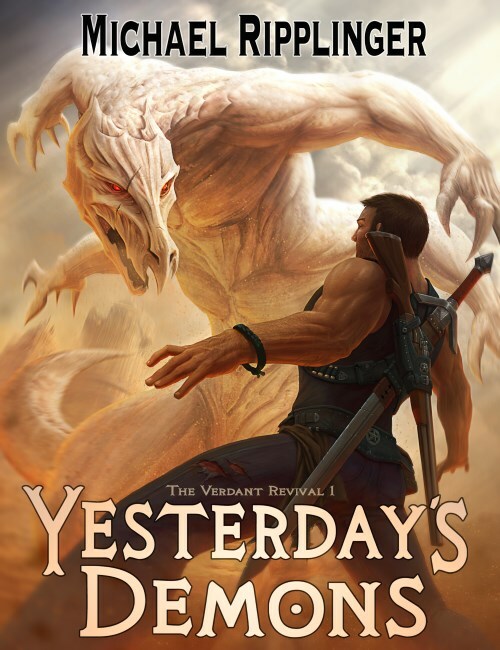 Finally, Yesterday’s Demons is the first book in a trilogy called The Verdant Revival. But it is also a self-contained story with a beginning, middle, and end. I love series of books, but I feel each installment also has to be its own story — no “overgrown prologues” as my editor would call them. Yesterday’s Demons gives you a complete story but also will leave you wanting to read more about planet Verde and the young heroes who live there.